Gabriel Urbain Fauré (12 May 1845 ? 4 November 1924) was a French composer, organist, pianist, and teacher. He was the foremost French composer of his generation, and his musical style influenced many 20th century composers. His harmonic and melodic language affected how harmony was later taught. Fauré was born in Pamiers, Ariège, Midi-Pyrénées, to Toussaint-Honoré Fauré and Marie-Antoinette-Hélène Lalène-Laprade. He was sent to live with a foster-nurse for four years. At the age of nine he was sent to study at the École Niedermeyer, a school which prepared church organists and choir directors in Paris, and continued there for eleven years. He studied with several prominent French musicians, including Camille Saint-Saëns, who introduced him to the music of several contemporary composers, including Robert Schumann and Franz Liszt. In 1870, Fauré enlisted in the army and took part in the action to raise the Siege of Paris during the Franco-Prussian War. During the Paris Commune he stayed at Rambouillet and in Switzerland, where he taught at the transported École Niedermeyer. When he returned to Paris in October 1871, he was appointed assistant organist at Saint-Sulpice as accompanist to the choir, and became a regular at Saint-Saëns' salon. Here he met many prominent Parisian musicians and with those he met there and at the salon of Pauline Viardot he formed the Société Nationale de Musique. In 1874, Fauré stopped working at Saint-Sulpice and began to fill in at the Église de la Madeleine for Saint-Saëns during his many absences. When Saint-Saëns retired in 1877, Fauré became choirmaster. In the same year he became engaged to Marianne Viardot, daughter of Pauline Viardot, but the engagement was later broken off by Marianne. Following this disappointment he travelled to Weimar, where he met Liszt, and Cologne in order to see productions of Richard Wagner's Der Ring des Nibelungen. Fauré admired Wagner, but was one of few composers of his generation not to come under his influence. In 1883, Fauré married Marie Fremiet, with whom he had two sons. In order to support his family Fauré spent most of his time in organising daily services at the Église de la Madeleine and teaching piano and harmony lessons. He only had time to compose during the summers. He earned almost no money from his compositions because his publisher bought them, copyright and all, for 50 francs each. During this period Fauré wrote several large scale works, in addition to many piano pieces and songs, but he destroyed many of them after a few performances, only retaining a few movements in order to re-use motives. During his youth Fauré was very cheerful, but his broken engagement combined with his perceived lack of musical success led to bouts of depression which he described as 'spleen'. In the 1890s, however, his fortunes reversed somewhat. He had a successful trip to Venice where he met with friends and wrote several works. In 1892, he became the inspector of the music conservatories in the French provinces, which meant he no longer had to teach amateur students. In 1896, he finally became chief organist at the Église de la Madeleine, and also succeeded Jules Massenet as composition instructor at the Conservatoire de Paris. At this post he taught many important French composers, including Maurice Ravel and Nadia Boulanger. From 1903 to 1921, Fauré was a critic for Le Figaro. In 1905, he succeeded Théodore Dubois as director of the Paris Conservatory. He made many changes at the Conservatoire, leading to the resignation of a number of faculty members. This position meant that he was better off in terms of income, and he also became much more widely known as a composer. Fauré was elected to the Institut de France in 1909, but at the same time he broke with the Société Nationale de Musique, and supported the rogue group which formed out of those ejected from the Société, mainly his own students. During this time Fauré developed ear trouble and gradually lost his hearing. Sound not only became fainter, but it was also distorted, so that pitches on the low and high ends of his hearing sounded like other pitches. He made efforts to conceal his difficulty, but was eventually forced to abandon his teaching position. His responsibilities at the Conservatoire, combined with his hearing loss, meant that Fauré's output was greatly reduced during this period. During World War I Fauré remained in France. In 1920, at the age of 75, he retired from the Conservatoire mainly due to his increasing deafness. In this year he also received the Grand-Croix of the Légion d'Honneur, an honor rare for a musician. He suffered from poor health, partially brought on by heavy smoking. Despite this, he remained available to young composers, including members of Les Six, who were devoted to him. 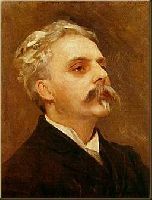 Gabriel Fauré died in Paris from pneumonia in 1924. He was given a state funeral at the Église de la Madeleine and is buried in the Cimetière de Passy in Paris. 496 scores found for "Gabriel FaurÃ© " on . Edited by Richard Walters, compiled by Richard Walters. Collection for soprano voice solo and piano accompaniment. Text language Latin, German, English. 223 pages. Published by Hal Leonard.